I haven't been in this game long enough to qualify making this claim or statement but I think it was a mistake for bullseye shooters to embrace the use of red dots. And now it seems that it's almost necessary to compete if the field is completely open. The problem that I personally have with red dots came to me after finally trying one for the first time on a revolver, a S&W 686. I don't think the 686 is the most elegant of all revolvers but it's still a beautiful gun. And it sort of saddened me after putting a red dot on it. No longer did it have the grace and charm it once had after putting the giant black wart on top of it. No doubt it's easier to shoot, especially with aging eyes but something is now missing in the experience. Why did you folks ever allow red dots? What was really gained and what was lost in the process? One shooter's dot is another shooter's wart. One of the things I enjoy about bullseye is that it is an individual sport and barring any rule infractions, and safety concerns, I can compete as I choose. I'm shooting wart free right now, and I love it. Sure, with a wart I'm shooting 2% or so better scores, but I'm really enjoying the difference in the concentration that shooting irons has for me. I'm in it for me anyway. Agreed Rob. That's why I shoot service pistol and air pistol in addition to BE. Each match I'm simply trying to do my best regardless of who is on the line. Merry Christmas and Happy Wartless New Year. The word wart wasn't meant to be derogatory, simply my impression of the red dot on the revolver. But the larger question is really the expanded envelope bullseye shooters have allowed in their rules. As I understand it red dots were only used after the rules allowed them. What's to prevent the inclusion of laser sights in the future or thermal seeking devices linked to electronic triggers? Just thinking out loud. But my 686 still looks like it has a wart on top of it. I don't like the look of revolvers with dots or scopes. The first time I saw one in competition was at a Harry Reeves match at Perry and it was a 2x scope on a 454 Casull yes some asshat was shooting it in the Reeves Match - it was reduced load but still plenty loud. Those with good eyes can shoot open sights every bit as good as an optic and as James pointed out the National record was made with open sights and still stands 40 years later! Lasers and etriggers controlled by "locating" software will never be allowed but then I said air shifters would never be allowed on a drag bike either - that was a while ago! It is surely a misconception that you need a red dot to be competitive. Yet for those of us with failing eyesight, dots make continued participation realistic, just as F class has been a boon to participation in long range rifle. And yes, I hate the look of the dot on my otherwise classic K-38, but I like what it does for my scores. I have "experienced" iron sights for 50 years, so thanks for those who saw fit to allow the dots! Frankly, I don't think dots are "that" easy to shoot. About 20+ years ago, I was still competing heavily, more so in PPC, because I had not retired from the PD, yet.. 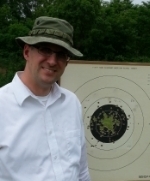 I was also shooting regular bullseye matches.. At a Quantico match, a "very" accomplished Marine Corp shooter, and good friend, Rich Rodriquez suggested that I restrict my training to the dot, in preparation for the Sept. PPC Nationals in Jackson, Miss. I took his advice, and trained all summer with dots... The open sights on the PPC guns appeared to be rock solid, the movement of the dot forced me to improve my hold, and trigger control.. I won the Master class at the Pearl Regionals, with a personal best, and the following week at Jackson, I again won the Master class at the Nationals, along with High Master over all in the distinguished class with a 45 ball gun, and received my High Master card..It was the high light of my PPC career. Rick's advice was rock solid.. I think a dot will get the average shooter into Expert class, with modest effort, but it takes much dedication and training to move beyond that, even with a dot. Having competed in bullseye since the stone age, I can remember only shooting irons and watching my scores deteriorate due to eyesight. I comptemplated giving up the sport since I was so frustrated. If we did not develop red dots, I doubt that I would be competing today. the competition has kept me seeing the eye doctor to maintain my eyesight. Ok, here's a long winded opinion on the game and dots versus open. Just some thoughts and observations after a number of years of struggling and trying to learn both. Not arguing for one over the other, just stating some opinions that took a long time of shooting and learning to get to. Maybe in another 20 or 30 years of shooting I'll have some differing ones. Who know? Well, as for "allowing dots, it appears they were never "disallowed", so the rules seem to have just been modified to preclude using sights to activate the trigger. In actual effect over the years, it appears that the is really no difference between using the dot versus optical versus open sights as far as the highest score is concerned so therefore the "rules" guys probably got it right. As noted, no one's beaten the open sight agg yet. Heck, even old "Doc" shot a 2X scope up until he quit shooting and did quite well. In essence, it appears that there is not overall consistent advantage to shooting one over the other (as far as winning matches goes, see other comment below), except for the individual preference and abilities of the competitor. I will say again (and I have said before) if possible you should train and shoot with both to learn how to get better. Dots allow you to see the complete wobble; hand, gun, trigger, body movement, etc. and can compensate a little for older eyes. But don't be fooled into thinking a fuzzy dot is OK, get some glasses to make that sucker sharp if you need to. Open sights teach you what the gun is doing (not the overall wobble) by showing you how the front sight is moving compared to the rear, giving you feedback on grip pressure, trigger process, wrist movement, etc. If you are looking at the front sight, then the overall wobble becomes easier to accept. And by looking, I mean seeing the front sight and the dust particle sitting on top of it, and the exact relationship of the "bars of light" and the top of the sights. And not just seeing the "picture" but keeping the sights absolutely and completely aligned throughout the trigger process. Dots help by combining the front and rear sights into a single dot, but now its also mixed up with all the other arm / body wobble, shakes, etc. If you are looking at the dot, you will begin to see the wobble pattern (when it is consistent and not messed with with that trigger jerk and other stuff you saw with the open sights and that is too fast to see sometimes). That helps us learn trigger timing, or the best time to complete the process during the minimum wobble. Dots can be more consistent since we more naturally tend to see and align the dot (circle) in the center of the black (circle). I will say that I believe that open sights, for those with acceptable eyesight, can be overall more consistently higher scoring, especially for slow fire. To be specific, I think they allow a more precise hold of the pistol (keeping the pistol parallel with the intended trajectory of the shorts) since we are mostly seeing the relationship of the front and rear of the gun. And its easier to see that 1/1000's of an inch difference with the relationship of open sights (front and rear) than the precise relationship of the dot in the black. Open sights help us ignore the "wobble", but keep the alignment precise. But it takes great dedication and training to accept the wobble with open sights. But, neither rain, nor snow, etc. mess up open sights. Just learn what the lights conditions do for your grouping. I believe the dots allow shooters to progress more quickly to Expert or so, but hide the fact the shooter is missing some fundamentals of keeping the gun parallel, and so they learn to "pick off shots" but never understand why their wobble is not consistent. (See comments on what we learn from open sights.) So a lot of shooters shoot only with dots, thinking it will make them better since it got them that far. Dots help the shooter focus on one thing, but that training should be used to help focus on the front sight when training with open sights so we can learn how to hold the gun more aligned throughout the shot. So, do dot sights belong on a bullseye gun? According to the rules, even telescopic sights are allowed. Does it create any unfair advantage, probably not since everyone has the option of choosing what works for them. Does it help older guys and new shooters shoot slightly better, maybe. If you don't like the wart, then shoot open sights if you want to. I did to Master in about a year (with glasses no less) and shot a couple of high master scores before moving to dots. For me, I guess that for a 900 match, it would not matter. But I'd get pretty tired, eyesight wise and the eyes use lots of energy, doing a 2700 in one day at my age now. This is all very interesting. I didn't know about the '74 record using open sights no less and it not being bettered to date. In the last 5 years or so has there been any winner of a 2700 that didn't use a dot? Also, for the arguments favoring the inclusion or lack of exclusion of dots in the rules why couldn't the same apply for lasers. I have never used one and know next to nothing about them but wouldn't the same fundamentals that CR10X talks about to be competent with a dot also apply to a laser? What exactly does the laser take away from the game? "What exactly does the laser take away from the game?" Most Lasers are near useless at 50 yards for a precision shot in bright sunlight light. Lasers have the potential to distract a fellow shooter if your laser inadvertently crossed their target. They would all but eliminates the chance for a crossfire, which is part of the game. Just imagine a line full of lasers shaking all over the targets downrange. Just as you are ready to shoot the guy on the next target over jerks his laser all over your target. No thanks. The laser "aiming" devices that you find on the market now are a gimmick. They are certainly not accurate. Just another toy to bolt to your firearm. As far as lasers go, the can be very accurate for a specific distance and mounting arrangement. Unfortunately, most people can't shoot for crap anyway and it ain't because of some open, dot or laser sight. It does not take away anything, it adds a complication that is hard to handle when many people are on the line shooting. The the big issue is, "who's dot is that on that target?" unless everyone has a different color or strobe setting. You should see a group of guys with lasers trying to figure out which one is where on a target. Aiming via laser is great for just one guy, more than one, its like a guy with two watches. (A man with one watch knows what time it is, a man with two watches is never sure.) Of course you can assume that in competition everyone would be on their target, yea, right? I can just see someone screwing another competitor by putting their red dot on his target when they are working on a shot. By the way, going all the way to lasers only, like pentathlon, takes away that big bang and recoil factor that separates the shooters from the flinchers. Anyway, lots of thought got the rules to where they are. Spend time working on the fundamentals and let the other guy think about gaming the system or spending more time reloading than dryfiring. Sorry, used up posting for today. More dryfiring tomorrow. The laser "aiming" devices that you find on the market now are a gimmick. When I was still on the police range, quite a few years ago, we tested the pros & cons of lasers with the SWAT TEAM.. My best team members were 3 / 4 times faster and more accurate with irons sights.. Paint it black and call it "Tactical" didn't work..The fascination with Lasers quickly died..
Lots of the old guys currently shooting M and HM were Master class shooters with iron sights back when there was no HM and scopes were rare. Then Joe Pascarella won at Perry a couple of times with his red dots and the rest is history. Most of the old guys from back then who are still shooting are only able to because of the red dots and scopes. Look up and down the line at the age of the shooters. Personally started back this year after an 18 year break. Sixty one years old and one of the younger guys on the line. beeser wrote: In the last 5 years or so has there been any winner of a 2700 that didn't use a dot?